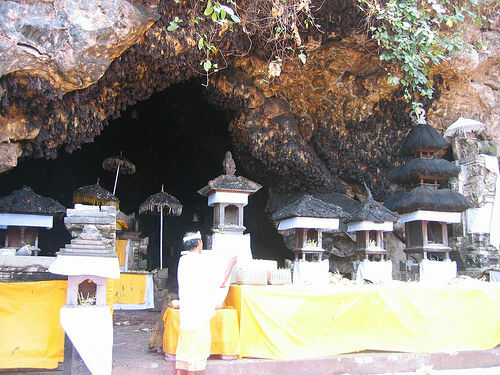 The cave temple is located in the Village Lawah Pesinggahan, District of Dawan, Klungkung. Located on the seashore, and is approximately 52 kilometers from Denpasar City. 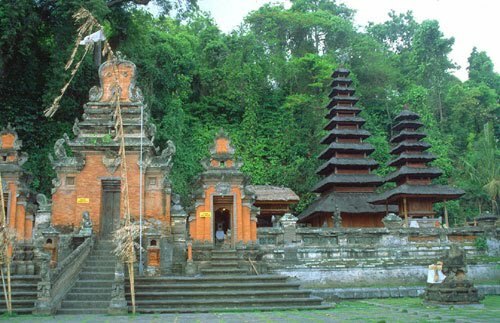 Pura Goa Lawah Represents one of “pura Khayangan Jagat” in Bali, which is a mix between the sea and the mountains which contain a sense of gratitude to Almighty God in manifestation Girinatha as a protector of the mountain and Varuna as the ruler of the sea. Not known for sure who is the founder and when it was founded Pura Goa Lawah but the temple is estimated founded by Mpu Kuturan in 11 century. The uniques of this temple is its inhabited by thousands of bats that nest inside the cave. Gua Lawah Temple glorified as parahyangan Ida Sang Hyang Widhi Wasa, in its manifestation as Dewa Maheswara. It is not known definitely the year of establishment Lawah Cave Temple. In the old manuscript Usanas´ The Cave Temple Deity mentioned by Mpu Kuturan Lawah founded around the 10th century AD. While in Lontar Dwijendra Tattwa, narrated trip Dang Hyang Nirartha to Bali at about the 14th century AD. As I passed Kusamba Coast, he discovered a cave containing pelinggih and inhabited bats. He later named this pelinggih: Lawah Cave Temple. From the description of the two manuscripts, we can conclude, Lawah Cave Temple was founded by the Mpu Kuturan, around the 10th century AD. Pura Goa Lawah take care by residents of the Village Pesinggahan with Pujawali or piodalan in the temple is conducted once every 6 months according to Balinese calendar, which is in Anggarkasih Medangsia. The view in this place was unique, a cave look under the shady trees, while the mouth of the cave there are several pelinggih. Pura Goa Lawah occupy coastal areas that meet the hills. Temple courtyard stood firm several Meru and other stana. At the temple, precisely in the mouth of the cave there are pelinggih Sanggar General as Sang Hyang Tunggal worship (God Almighty), Meru Tumpang Three, Gedong Limasari and Gedong Limascatu. It’ very beatiful., so if you visit Bali don,t miss this temple.